Looking for the perfect container to complement sedum and Sempervivum? 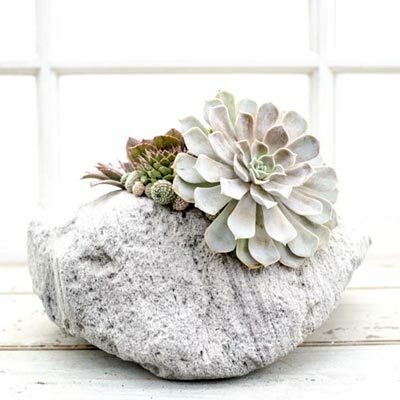 Our all-natural Featherock planter has a 4" deep and wide opening, hand-carved from volcanic pumice stone. It's perfect for planting with succulents or holding a pillar candle, for a chic patio display. Each stone is hand-selected and drilled, 100% natural lava rock; so color and size will vary slightly. The overall planter will measure approximately 12" x 14" but as we mentioned, each is unique. Paired with our single and double small opening stones, you can make a display combining air plants with your sedum collection. If you've ever considered xeriscaping, the practice of gardening with plants that require little water or soil, then Spring Hill has you covered. We are proud to introduce our newly developed line of presentation options perfect for use with air plants such as Spanish Moss and Tillandsia. These carefree plants are must-haves in any xeriscaping display.